Year 12 students will be taking part in the National Citizenship Service, coordinated by Warrington Youth Club. In college, they have been developing their teamwork skills in regular sessions coordinated by NCS and Warrington Youth Club. Their work supports the PiXL Edge framework we have in place at UTC Warrington. Student activities have reinforced team communication, the ability to identify and overcome challenges, and the need to be resilient in testing circumstances. 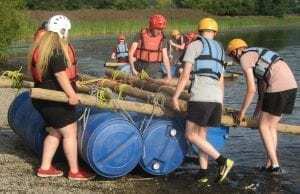 Between 30th October – 2nd November, Year 12 students are invited to take part in a four day residential trip where they will work with their peers in a number of activities including outdoor pursuits, rock climbing and raft building. The activities will take place at Open Doors Adventure Centre in North Wales. For further information on the trip and securing your place, please click here: NCS Parent Information Pack. Students will return to UTC Warrington for a community project, developed to provide students with life skills and awareness in mental health, disability, first aid and running projects with local businesses. NCS is an important part of our sixth form curriculum, allowing our students to develop their skills for future studies and employment. NCS is a rewarding programme of activities, recognised by UCAS and apprenticeship providers. UTC Warrington is the only college in the local area that has integrated the programme into the curriculum.